I'm still in the middle of the fourth fast of "Fasting February" which is definitely the longest fast of my life. As I write this I'm over 266 hours (over 11 days) fasted. NOTE: Fasts over 7 days should always be monitored by your physician. I'm pretty psyched about accomplishing such a long fast. But it really hasn't been that hard. I've been very diligent about keeping up on my salt, magnesium and water to keep my hydration and electrolytes normal. I am also officially in the 230's although I expect that when I start to re-feed I will go back into the 240's for weight. I'm not sure when I will break this fast, but it will probably be today or tomorrow. I will only have another couple of days to fast to meet my goal of 20 days fasted in February. In any case I consider this quite an accomplishment. I've also gotten my largest blood ketone reading of 6.7. I also have the next meetup for the Minnesota Ketonians group scheduled for March 10. I'm also working on some projects to make it a valuable group to all of its members that I will announce when I'm further along. That's all I have for today. Keep Calm and Keto On! 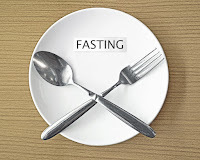 My next blog post will include "Fasting February" updates. You can also read my last post which describes this fast at the 200 hour mark.